Kathryn Bigelow is a powerful filmmaker and with Detroit, she reminds us just how good a director she can be. Detroit features a rich ensemble of actors, some recognizable, some not, who largely play their parts exceedingly well. Will Poulter might hang around come awards season for his turn as Officer Krauss. The Algiers Motel incident is almost a movie-within-a-movie. That sequence is challenging, devastating, and some of the most intense cinema I have seen in quite some time. In wanting to tell a rich and robust story, Detroit suffers from its 143 minute running time. Had Bigelow and Boal focused almost exclusively on the set-up and told the Algiers story, Detroit could have potentially been another extraordinary achievement for this tandem. 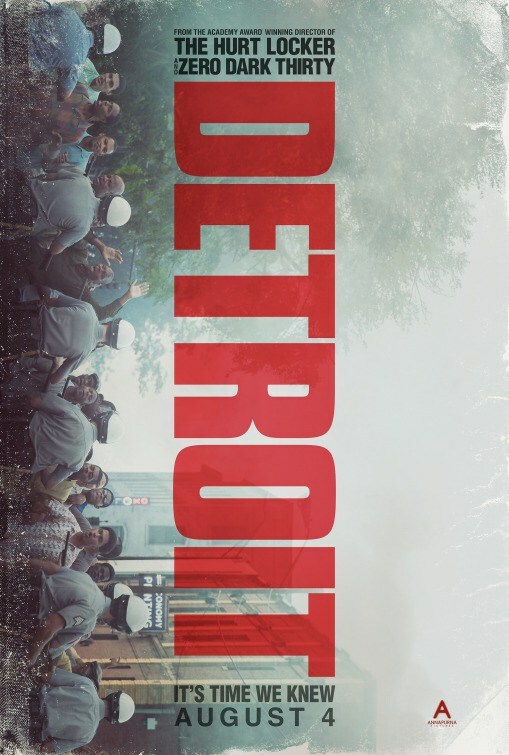 Though the film ends with a hint of personal redemption, Detroit seems lost on what it is ultimately trying to say, beyond the obvious ugliness and deplorable actions of a story, though 50 years old, that could easily be in tomorrow’s news. Gives too much to the naysayers, allowing an unfortunate deflection of the film as meaningless or manipulative. By giving more, more is given to those who would likely already determine this to be a partisan, agenda-b(i)ased film. On the night of July 25, and the morning of July 26, 1967, 12 young men and women, 10 of them African-American males and two of them white females, kept hostage and terrorized by three white police officers in the Algiers Motel. The officers had been told that snipers had reportedly fired shots from the location, and they rounded up a dozen individuals and demanded a confession from the person or persons involved in the alleged shooting. With no confession provided, by the time the incident came to an end, three unarmed young black men would lose their lives, and the remaining seven men and two women are beaten and humiliated by the officers. The Algiers Motel story is a significant one, existing within the larger story of the five-day-long Detroit Rebellion of 1967. In the 50 years that has passed since that night’s tragic events, an argument could be made that nothing much has changed in the tensions between minorities and law enforcement. If anything, in the age of social media, we see these conflicts amplified like never before. This story, however, has seldom been shared in the tapestry of stories comprising the American civil rights movement. When Michael Brown’s case resulted in the acquittal of police officer Darren Wilson in Ferguson, Missouri in 2014, Oscar-winning director Kathryn Bigelow, and partner and collaborator Mark Boal, felt that the time was right to bring the story to the big screen. Much of Detroit is a searing and visceral experience, the past crashing into the present. After an animated primer, documenting racial tensions in the Motor City opens the film, featuring paintings and artwork from the late African-American artist Jacob Lawrence, we witness the incident which sparked the 1967 rebellion. Routinely, clubs and speakeasies would play host to parties for any number of reasons. On July 23, one of these clubs, nicknamed a “Blind Pig”, was playing host to approximately 80 black attendees, celebrating the safe return home of two Vietnam soldiers back to the community. Police were called, they came and broke up the party, and started loading people into police vans. The son of the owner of the club threw a bottle at the police, tensions escalated, and things spiraled hopelessly out of control. The Detroit Rebellion was underway. The Algiers Motel incident began with reports of shots being fired near the vicinity of the building. When officers located individuals visible in the windows, they opened fire on the motel, shot out a number of windows, and advanced. One teenager, Carl Cooper (Jason Mitchell), having allegedly discharged a starter pistol as a fateful prank, would be killed as police arrived at the motel. The three white police officers in question, rounded up the remaining individuals, leading to brutal, barbaric night for the innocent men and women held hostage at the Algiers. The middle of the film focuses exclusively on Algiers, occupying much of the film’s 143-minute screen time. In these moments, Bigelow crafts some of the most chilling and unsettling cinema of the year. We feel every slur, every punch and blunt-force attack, every gunshot. The fear generated by the officers on those being held at the hotel is palpable, unnerving, and revolting. Officer Philip Krauss (Will Poulter) emerges as the all-too-willing ringleader and orchestrator of the “interrogation techniques” used on the individuals, forced to stand against the wall, backs to the police, nearly the entire time. Krauss, like the other two officers, Demens (Jack Reynor) and Flynn (Ben O’Toole), are composite characters, but Poulter’s performance stands out, showing the actor tapping into the depths of a character we have not seen from him so far. Krauss, at times, is a downright frightening creation and Poulter’s finest work to date. Through Krauss we see Bigelow and Boal attempt to amplify strength and resolve among those being victimized. A significant portion of the film is framed with the story of Larry Reed (Algee Smith), a vocalist for burgeoning R&B singing group, The Dramatics, ever so close to signing a potential Motown record deal. Poulter interrogates Robert Greene (Anthony Mackie) at the Algiers, a man honorably discharged from the military, having recently returned home and striking up chatter with the two caucasian women (Hannah Murray, Kaitlyn Dever) caught up in the police raid. The girls also spend time with Larry and his best friend, Fred (Jacob Latimore) at the motel, a fact that the police officers simply find repugnant and incomprehensible. Bigelow and cinematographer Barry Ackroyd take us into the heart of the terror. Implementing handheld camera footage with a quivering, shaky aesthetic, the movie adequately and properly keeps us on edge. As Krauss pushes himself wilder and crazier, egged on to be more cruel by his own ego and bravado, even his fellow officers are unclear with how to stomach what they are watching. The National Guard pulls back. County officials arrive, survey the scene and decide to look the other way. A security guard, Melvin Dismukes (John Boyega), first appears in the film offering coffee to the National Guard. After a make-nice with them, he becomes an unwitting observer to the officers’ actions in the motel, initially trying to understand their actions, then slowly realizing that something horrific and unconscionable is unfolding before him. As the events are depicted with significant accuracy, based on Boal’s exhaustive research and gathering of information, the film foregoes context, impairing those unfamiliar with the story to dig deeper, beyond the shock of what is shown on screen. The crux of the final scenes of the film takes us to the courtroom, where the officers stand trial, facing an all-white jury. John Krasinski‘s turn as lead counsel for the officers never quite connects. Somehow, and rather inexplicably, Bigelow mutes the anger we should be feeling when verdicts are read and the dismay of what has transpired washes over the audience. A number of vignette-style scenes are used to button up the film. We mostly feel the impact the Algiers incident had on Reed, a man whose very survival renders him unable to hold a job, perform on stage, and almost cowering in fear when forced to leave his home. Detroit is, in totality, a very good film, but the extended running time and padding around the Algiers Motel scenes dulls the film’s devastating interior. When Bigelow forces us to exist in the horror, to feel pure hate, and to confront our reactions to the atrocities being doled out, or ignored, and then condoned, this is a movie with the potential to be one of the best of 2017. In their third collaboration together, Bigelow and Boal find an absence of concise and efficient storytelling, which undercuts the overall impact of a film, and a story, we perhaps all need to see, understand, and experience. Starring: John Boyega, Will Poulter, Algee Smith, Jacob Latimore, Jason Mitchell, Hannah Murray, Kaitlyn Dever, Jack Reynor, Ben O’Toole, John Krasinski, Anthony Mackie, Joseph David-Jones, Ephraim Sykes, Leon Thomas III, Nathan Davis, Jr., Peyton Alex Smith, Malcolm David Kelley, Laz Alonso, Miguel Pimentel, Glenn Fitzgerald.